Super yummy wor. I will try to make it, thanks for sharing. This is one of my mom's favorites, great for parties too, not to say it is SO healthy! 你好,很欣賞你的菜譜和相片, 很羨慕你做得一手好菜, 我照跟你煮了幾道菜都很成功, 其中豆腐花真的很省時和容易, 惟一做這紅豆糕就失敗了. 好想回味小時在小販檔買到的三層菱角形紅色糕, 底面分別有水晶面夾住這涵料. 我跟足你份量做此糕, 但蒸好後有好大陣粉味. 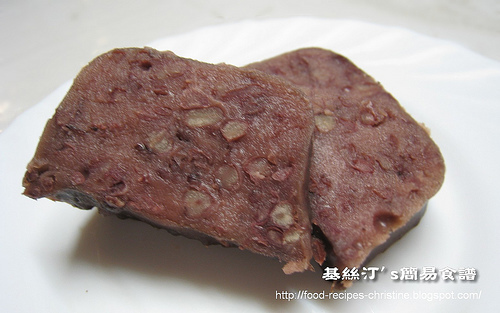 完全不是紅豆糕味. 點解呢 ? 謝謝你提醒, 我相信是蒸糕盤壞事, 我會照你提議用輕身的蒸糕盤. 另明白放糖時間. thanks ! Thank you for your fast reply. will try to do it tonight. thanks a lot ! anyway thanks for the recipe! I want to know if I can use cooked red bean paste or cooked red bean can becuase I have both cans in the pantry, I really want to use them. haha...If I can, do I need to adjust the volumn? Also, if I cannot find wheat starch, can i use anything to replace it? thanks. Yes, you can use the canned red bean paste. As far as I know, they are sweetened too. Thus, you have to adjust the amount of sugar when cooking the batter. As wheat starch has got some gluten in it that makes the texture of the cake quite springy, not soggy. Maybe you can try wheaten cornflour to see how it goes. The texture won't be exactly the same as mine for sure. I haven't experiment with it though, just an idea. Yes, you can use any cake pan for steaming, just adjust the cooking time. For your thinner pan, it would shorten the steaming time too. hi. if i use a muffin pan to steam this like your mini BOOK CHAI GOU method, what's the approximate steam time for that? That'd be very quick, about 15 mins or so. You might test it with a needle, without any flour taste of the mixture, that's cooked through. How much water left when you cook the beans with 3 cups of water and how long did you cook the bean ? I soaked the beans over night and cooked with baking soda for an hour still very hard. So I drained the beans and cooked again with 3 cups of h2o for another half hour and follow the rest of the steps. The result is ok. I didn't check the time. I just add 3 cups of water and cook the red beans that have already soaked for several hours. 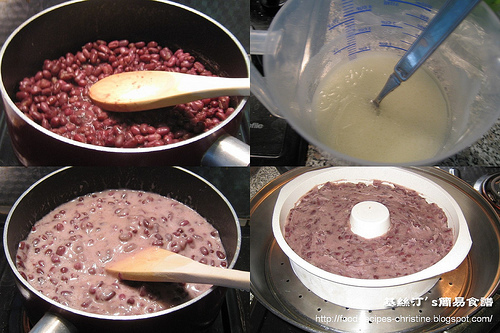 When the water almost dries up, shown in the top left picture on this post, the red beans are really tender, but still hold the shape. Remark: my stove is an electric, glass-ceramic cooktop, so I can use very low heat, and don't lose many water along the way of cooking. If using gas stove, more water will be needed. Or just add a certain amount of water when the water dries up but beans need more cooking time. The consistency of the batter should look like the left bottom one of the 2nd picture above. Don't try boiling all the water away while cooking red beans. If you can see the cooked red beans are very moist with a little bit of water left, that will be perfect. Don't worry, you'll get it right after you've tried once. Hello Christine, is there a substitute for vegetable oil? I have olive oil and corn oil at home. Thanks for your time. You can use any oil without any smell. Corn oil is better than olive oil for making this dessert, as olive oil has a strong smell.